Website conversion is increased using a variety of strategies all of which play an important role in the ultimate effectiveness. The reason I continually bring it up is because it is one of the most important factors playing a role in your success, yet is most often overlooked by many store owners. This quite possibly could be because the customer experience is an all-inclusive concept involving many systems working in unison. The customer experience is not a single tangible element which can be held or altered but rather a series of elements which make up a system upon which the customer relies to get them to their end goal — making a purchase. For it to be effective, each of the elements which make up the system must each be in top shape. A big part of that customer experience lies in the content (text) your site uses to describe everything from products to the way you use them to your business itself. This is your chance to shine — and many stores fall short. Take the following example from a dealer selling automobiles. Company Focused: The auto dealer features a particular automobile in its inventory as offering “30 miles per gallon.” Although customers may find this promo informative, they may not see the benefit this statement offers them. Customer Focused: The auto dealer lists the car and says “spend less on gas and save more money with this gas-efficient vehicle getting 30 miles to the gallon.” Now this phrase speaks to the customer. It provides them with a specific benefit that buying this car will give them. Everyone wants to “spend less and save more” right? So after that introduction and example, here are 4 tips you can implement to ensure your site is focused more on your customers and not yourself. Examine your content “bulk.” Content is what encourages customers to continue through the conversion path toward a completed sale. From product page and shopping cart wording to customer assurance terminology which builds confidence, make sure your site includes plenty textual content aiding users at understanding the purpose of each page, where to go next, and what to expect. Analyze and assess your content. Who does your content focus on (speak to)? 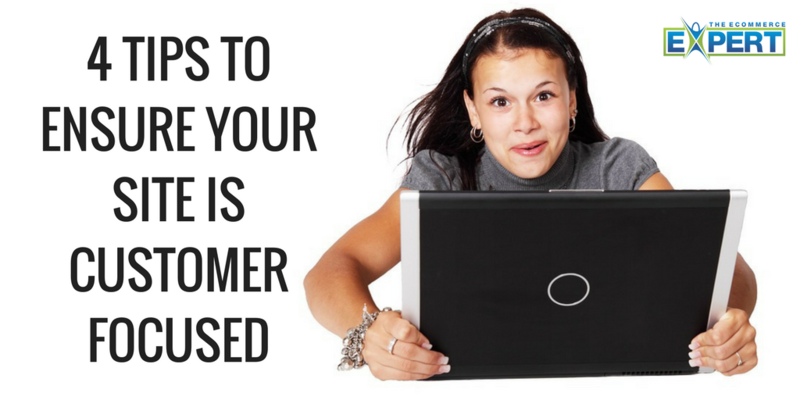 Is it your customer or your company? While content should describe your offers, products, and company (to name a few), it should do so from a customer perspective. Turn any “we” / “our” statements into “you” statements. Describe product and shopping benefits. Let your customers know more than just about what you offer; tell them how your offers or how shopping with you (instead of competitors) will benefit them. For starters, try to include one benefit for each attribute. Customers who clearly understand the benefits are more likely to turn into sales. Start from the top and work your way down. Begin updating content on the high-level pages of your site (home page, product pages, shopping cart, etc…) — pages that play the biggest role in moving customers toward conversion. Once the top level pages are out of the way you can focus on the lower level pages of the site. Another good option is to take a close look at your website analytics program to determine which pages have the highest bounce and exit rates. Examine these pages and use them as a starting point for your improvement with the goal of keeping customers from abandoning at those points.